Any day is a good day to go salmon fishing in beautiful Ketchikan, Alaska. A once in a lifetime experience in one of the most scenic regions of the world can be a lot more affordable than most people think. For those who want a memorable experience and lots of wild caught King or Silver Salmon to take back home it doesn’t get any better than Anglers Adventures & Outfitters. You choose the half-day, full day or multiple day salmon fishing charter package that best fits your budget and we provide the rest. Sport fishing for wild Alaskan King salmon under the guidance of a seasoned fishing guide like Captain Brian is one breathtaking adventure that you will never forget. The reviews we receive from the people we take fishing is why we do what we do. 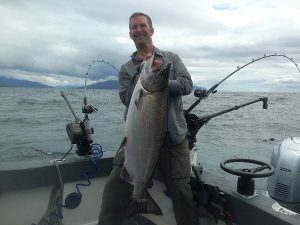 Captain Brian is the top fishing guide in Ketchikan, Alaska, and the only one that even lets the half-day charter clients customize their trip! What’s not to like about a day out on the water catching flavorful, nutritious and sustainable wild salmon? You don’t need a lot of experience or money to catch local Chinook (King Salmon) or Coho (Silver Salmon) that are found in the waters around Ketchikan, AK. Anglers Adventures knows all of the best places to find the salmon that you want in season. Our experienced boat captain and fishing guide can set you up with all of the fishing gear, guidance and available salmon fishing license that you need to reel in the big one just like the pros. And when we say set you up…that means it is included in the charter price. If you are ready to climb aboard a private charter boat that is fully equipped for a four hour, full day or multi day salmon fishing trip, make your reservation with Anglers Adventures & Outfitters today. Everything that you need to have fun and catch amazing fish is included in all of our charter fishing options with the exception of your fishing license. For your convenience, they can be purchase on the boat. We supply the comfortable charter boat, fishing gear including bait, tackle and lures, amazing views, snacks and beverages. You and your party supply the eager anticipation and willingness to immerse yourself in a true Alaskan salmon fishing adventure. Pick the charter that fits your time and budget availability. If you are booking with us and visiting Ketchikan via a cruise ship, no problem, inform us of this when you book your fishing excursion and we will make sure you make it on time to your ship. 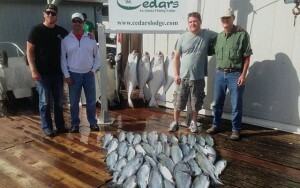 • 4 Hour – Half Day Charter Salmon Fishing Experience for 4 to 6 individuals are available for just $175.00 per person. “Halibit trips require a full day charter due to the distance it takes to fish them”. 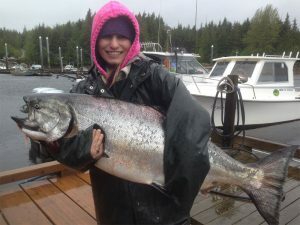 • 8 to 10 Hour – Full Day Charter Salmon Fishing Experience for 4 to 6 individuals are available for $350.00 per person. • Custom – Multiple Day Charter Salmon Fishing Experience for 4 to 6 individuals are available on request. Make the most out of your Alaskan vacation by chartering an affordable salmon fishing trip for a group of four to six people. Anglers Adventures & Outfitters has charter packages to suit just about any budget. Choose the time of year, length of charter and type of wild Alaskan salmon that you want to catch. Captain Brian can provide all the guidance, equipment and charter boat to have a successful trip for the entire group. Make a reservation for a memorable charter boat Salmon fishing experience that you can afford in Ketchikan, Alaska by contacting Captain Brian at Anglers Adventures & Outfitters at (907) 254-0880 or email brian@anglers-adventures.com.